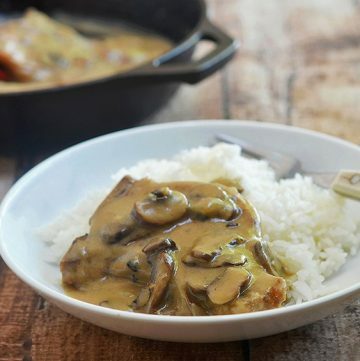 Smothered Pork Chops with mushroom gravy made of from-scratch ingredients and no canned soup. Super-tender pork and flavorful brown gravy perfect with rice, mashed potatoes or noodles. Cooks in one pan with oven and slow cooker options! 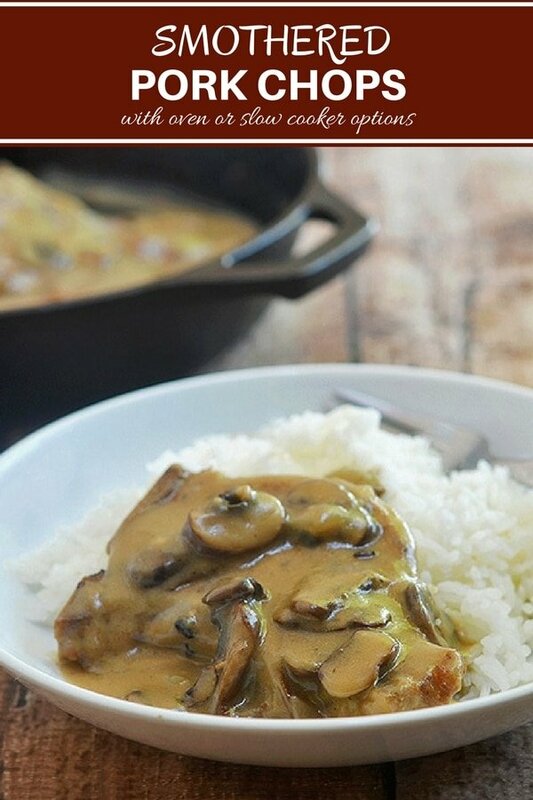 Smothered pork chops with mushroom gravy is my favorite go-to recipe especially for busy weeknights and there are many reasons why it should be in your back pocket, too! Ready in less than an hour and cooks in one pan for hassle-free dinner meals. From-scratch ingredients, using no canned soup! Can be made on stove top, in the oven, slow cooker or Instant Pot (separate recipe to post soon)! 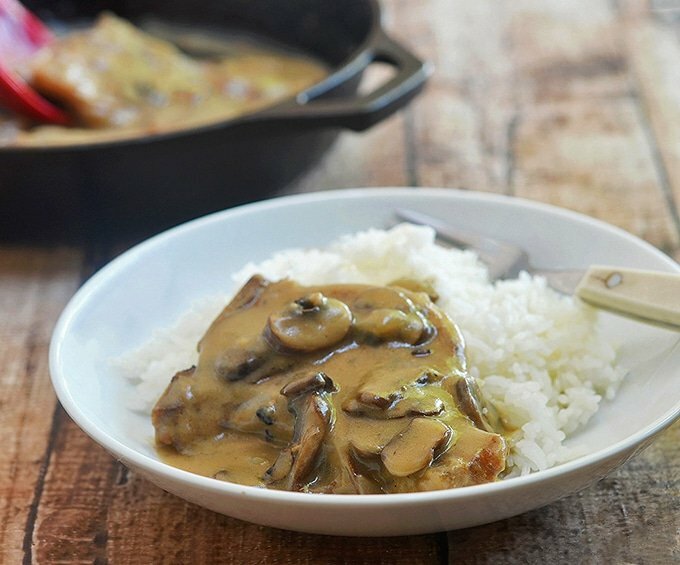 One big plus of this smothered pork chops recipe is how its cooked in one pan from beginning to end. 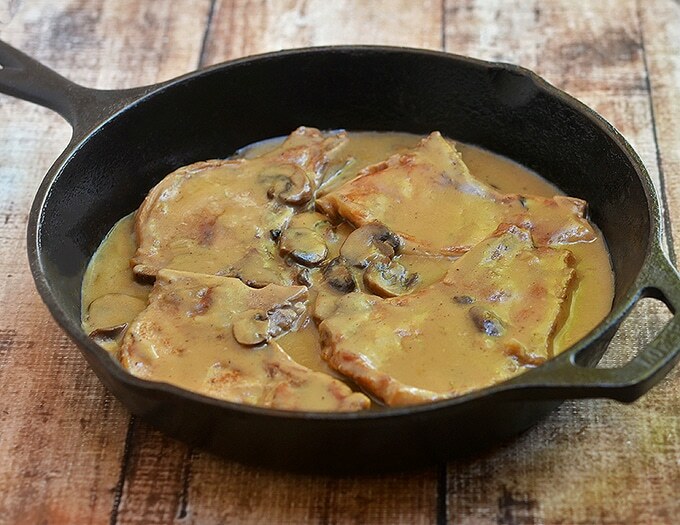 Browning the pork chops and making the gravy in one single skillet is not only easy and convenient but also bring amazing flavor by taking advantage of the tasty brown bits and pan drippings on the bottom of the pan. Take the pork chops out of the refrigerator about 10 to 15 minutes before cooking. Bringing them to room temperature allows for even cooking. To keep the chops from curling up during frying, score the fat or rind in half-inch increments. Pat the pork chops dry with paper towels to achieve a good sear. Make sure the oil is hot, heat over medium-high heat until shimmering and not a moment too soon! To maintain temperature, do not overcrowd the pan. Fry the pork chops undisturbed for 2 to 3 minutes or until they can be lifted without sticking and have a rich brown crust before turning on other side. I like to cook the dish on the stove top but it can easily be done in the oven, slow cooker or Instant Pot! Brown the pork chops. Remove from pan and set aside. Brown the onions and mushrooms. Remove from pan and set aside. Add flour to the pan drippings and cook until lightly browned. Gradually add beef broth to the pan, whisking vigorously to prevent lumps. Bring to a boil, whisking regularly, until thickened. 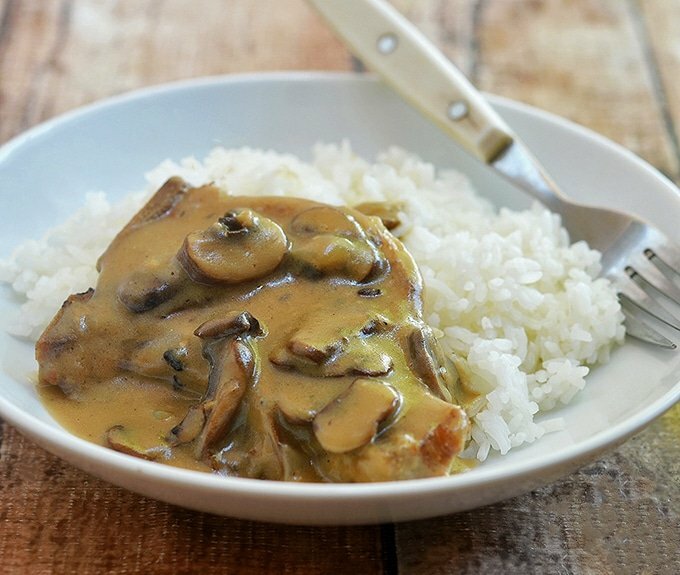 In a lightly-greased baking dish, arrange pork chops and top with mushroom mixture and gravy. Cover tightly with foil. Bake in a 350 F oven for about 1 to 1 1/2 hours or until meat is fork-tender. Arrange pork chops in slow cooker. Add mushroom mixture and pour gravy. Cook on HIGH for 3 to 4 hours or on LOW for 6 to 7 hours. Wash pork chops and pat dry. Season with salt and pepper to taste. In a wide, heavy-bottomed skillet over medium-high heat, heat about 2 tablespoons of the oil until shimmering. Add pork chops and cook for about 2 to 3 minutes or until browned. Turn and cook for another 1 to 2 minutes or until browned. Remove from pan and set aside. Add the remaining 1 tablespoon oil to the skillet. Add onions and mushrooms and cook, stirring regularly, until softened. Add garlic and continue to cook until aromatic. Add flour and cook, stirring regularly, for about 2 to 3 minutes or until lightly browned. Gradually add broth, whisking vigorously to prevent lumps. Bring to a boil, whisking regularly, until it begins to thicken. Add pork chops in a single layer. Lower heat, cover, and simmer for about 45 to 55 minutes or until pork chops are fork-tender and sauce is thickened. Season with salt and pepper to if needed. Serve hot with gravy as desired. This recipe is amazing! I love that it’s made from scratch without any condensed soups or soup mixes (aside from the beef broth which I don’t really consider the same) that are in so many other recipes I had found before stumbling across this gem. I brown the chops exactly as described and they are always melt-in-your mouth tender and so flavorful by the end. The gravy is simply scrumptious; there is plenty to pile onto rice, potatoes, or egg noodles. I’ve cooked this recipe in the slow cooker and on the stove. Both methods worked great. Thanks for sharing! P.S. I did tweak the recipe just a bit by using butter instead of oil for the gravy — a personal preference — but I’m sure it’s delicious either way. Love the mushroom gravy! Pinning!